While at the DSEI defense exposition in London, the Ukrainian/British company showcased an update to their flagship rifle (introduced in October 2016), the .300 WSM bolt action STL-016. That was reported by The Firearm Blog. Mainly, the replacement of the wooden stock with a polymer Archangel OPFOR Adjustable Stock commercially available in the United States. Picatinny rail sections have been added to the handguards at the 6 o’clock position to support a sling mount and what appears to be a Harris bipod. The picatinny rail supporting the optic appears to be the same as previous versions of the STL-016 with the rail attached to the action of the rifle itself. This action is a modified Mosin Nagant action. 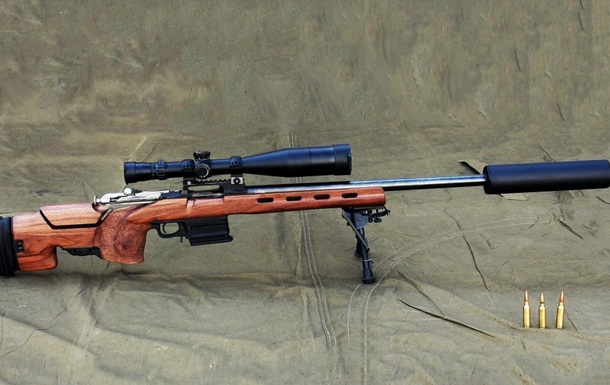 This isn’t the first time the Mosin Nagant has been married to a modern chassis system in the Ukraine, OUS previously offered a similar setup earlier last year. The rifle also comes with the same direct thread suppressor that came with the previous version. The company has also brought to market ammunition that can penetrate 11mm of armored steel at 800 meters. This comes in 7.62x54R and 12.7x108mm, which should be entering full production and commercial sale in the near future. Although the rifle is a Mosin Nagant with a low cost commercial stock, the need for it is due to the current conflict in the Ukraine, facing armored personal carriers and armor clad troops.